Most homeless people are thankful if they find a bit of cardboard and a blanket. Now there is an alternative. While sitting in church one day, I just thought to myself “How would I like to be treated if I found myself on the street? I’m 6’5” (196 cm) and I’d like to have a bit of comfort, stay dry and warm. So while working a full time job as CEO and founder of my own IT company – I decided to establish a charity called Swags for Homeless. Since 2007 we have distributed over 15,000 Backpack Beds to people without shelter throughout Australia. The charity now reaches 7 countries. My wife Lisa helped to design the patented Backpack Bed. We went to great effort to make sure the bed was both top quality and exceeded international standards. Unlike traditional canvas used in swags today, we needed something more robust and safe. The lightweight fabric we created especially for the Backpack Bed is Litetrex®. This breakthrough fabric technology makes the Backpack Bed water and mildew resistant, flame-retardant and warm. This portable bed easily converts into a backpack and makes the homeless look like anyone else on the streets during the day. The Backpack Bed comes with a built-in mattress, a three windowed tent, mosquito netting and a special pocket with padlock to lock away medications and valuables. The Backpack Bed has won seven international product design awards including Germany’s Red Dot ‘Best of the Best’ and is on display in four international museums – Sydney, Paris, Italy and Germany. According to those who have used them – they offer more than just physical comfort. Matt, a young homeless man who received a Backpack Bed, offers his perspective. It’s community minded corporates like iiNet that help us to help those that everyone sees sleeping on the street. It’s a team effort to keep homeless alive and protected from the severe outdoor elements – corporates, volunteers, the public and governments all working together. However without support, nothing is accomplished. 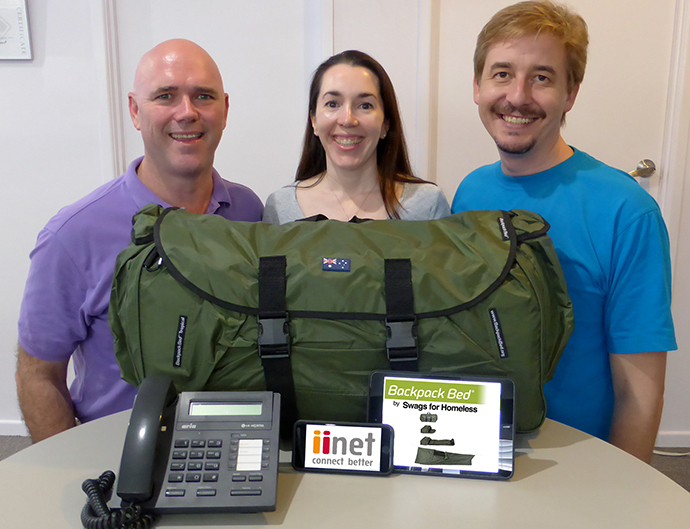 iiNet has been able to provide 12 months of outstanding telecommunications to Swags for Homeless. With the provision of land and VOIP lines, mobile phone plans and broadband – Swags for Homeless have been able to save $3000. iiNet staff have also raised an incredible $1700 through personal donations making an active proactive contribution saving street sleeping homeless across Australia. With a self sustaining charity vision, Backpack Beds are also sold to the public as a social enterprise with profits going back to help more homeless projects. We hope to help more homeless people in the years to come and thank organisations like iiNet for their ongoing support. For more information visit the Swags for Homeless website or Facebook page. Photo credit: Image provided by Swags for Homeless. Tony Clark is CEO and founder of Swags for Homeless. What a great initiative! Well done to Swags for Homeless, and to iiNet for their support. God Bless you for this invention. I have been trying to think of a similar product for these people,particularly in the cold and wet conditions. so I do appreciate what you have achieved. Congratulations, Well Done. Wow! A great idea – never heard of this organisation. We have an organisation called Hands & Feet that also works specifically with the homeless. We will certainly be in touch with ‘Swags for Homeless’. Thank you, iinet for introducing them to us! Brilliant! I can only hope this will be taken up by governments and organistions as well as individuals around the globe. Also great to know Iinet is on board. I think it is sad we have a homeless community it is nice to know that we have people who care about the unfortunate people who do not have a choice and are forced to live on the streets. GOD BLESS YOU ALL.